Medieval Welsh storytelling for the modern world. I've been posting mostly on Facebook lately, but I suppose I should make an effort to keep up this blog as well. We'll see how well I succeed. In the meantime, here's a picture from my garden - tomatoes in the cold frame (and a few timy peppers midstage right)! Well, it's still January. 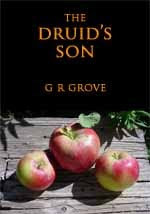 Been busy with Druids again, also creating ebooks - most of my titles are now available in the Amazon Kindle store, B&N Nook store, etc. Now to put in more work on the next book - The Fallen Stones - which is at last showing signs of life. 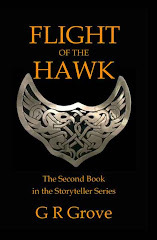 For those of you who enjoyed The Druid's Son, you'll find more of Togi / Mac Criomthann's adventures as inset stories in this fourth Gwernin Storyteller book! Taliesin and Aneirin - Christian Bards or Pagan? 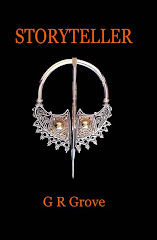 Books by G. R. Grove: The Storyteller series. Journeyman bard Gwernin Storyteller accompanies a Welsh princess to Ireland for her wedding. 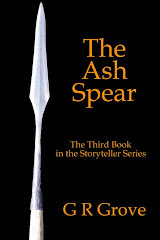 But other members of the party have their own objectives... Set five years after The Ash Spear, this will be the 4th book in the Storyteller series, and the beginning of a new trilogy. Scheduled for publication in late 2015. My published poetry series so far includes King Arthur's Raid on Hell and Pryderi's Pigs. Coming soon: Storyteller Songs, a collection of poetry and prose from the first three books of the Storyteller series.